to confirm a booking a 50%deposit is required. which can not be swept away and will cause damage to the structure. and roof, you are usually the last to realize your house is on fire. Some chimney flues require installing a cowl, which I supply and fit. rain water from entering the chimney causing your unit to rust. All of our chimney caps come with a lifetime guarantee. 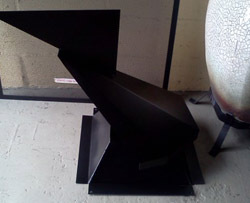 stoves including goadens, jetmasters,braais, and pizza ovens etc. 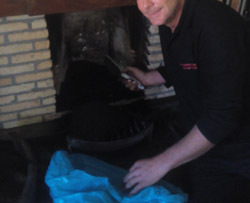 specializing in ensuring your fireplace and chimney function safely and effectively. 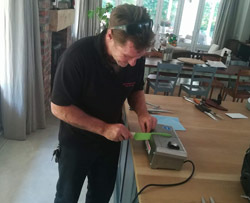 I use a machine which is serrated edge knife friendly, on site sharpening. 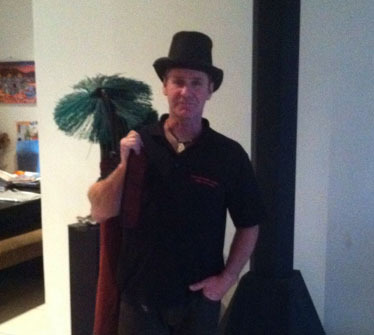 The difference between one chimney sweep and the next, is the mess they make in your house! 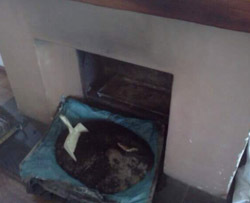 Some home insurance companies will not cover you if your chimney has not been cleaned once a year. No quote is needed, there is a standard price. The job takes less than an hour. creosote is contained behind a dust cover and removed by vacuum. from not having the chimney regularly swept. I still do the work myself occationally bringing a helper/apprentice. I have perfected my trade, the job is quick and clean. braais, and pizza ovens covering all areas. No quote is needed, there is a standard price. The job takes less than an hour.